There’s no doubt that early childhood — birth to three years old — is THE MOST IMPORTANT time to lay down that healthy foundation for a child’s rapidly developing brain. Those busy little brains need healthy and trusted attachments to a caregiver, appropriate but not toxic stress, lots of happy interactions with mom, dad, siblings, friends, puppies, kittens, grasshoppers, bubbles…the world. Get a great start at this age, and a kid has a better chance at a happy, healthy life and/or is better able to withstand some heavy hits later in life. Nurse-Family Partnership says that providing home visits for at-risk families results in a 48% reduction in child abuse and neglect, a 67% decrease in behavioral and intellectual problems, and 59% fewer arrests by age 15, among many other benefits. Since early childhood has such a HUGE impact on health, social services, prisons, etc. ; AND because there’s federal money for states to start such campaigns; AND because a couple of dozen different home visiting programs exist, it’s lucky for all of us that Pew Center on the States launched the Home Visiting Campaign a couple of years ago. Are you merely interested in how home visiting works? This site’s for you. 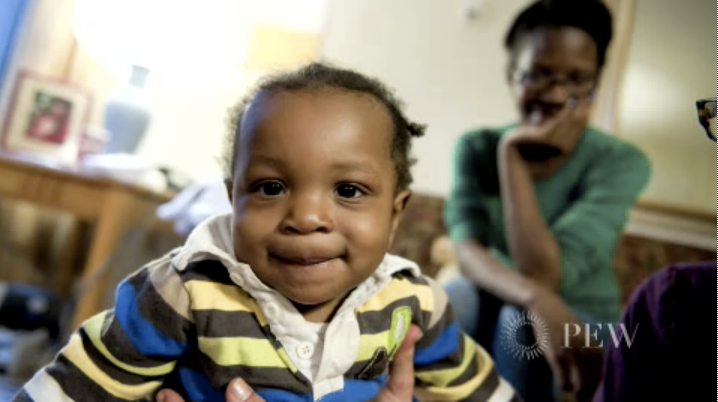 Are you an employee in a state that’s thinking about starting a home visiting program? This site’s also for you. Want to find out which program’s most effective and/or best for your situation? This site’s for you, too. everything wrong, take a look at this story. Astiare Logan, a single mother, talks about how home visiting worked for her and her son, Andrew. She began the program when she was seven months pregnant. This slideshow was done when Andrew was a cute, precious 15-month-old toddler. “One thing that the home visiting program has helped me learn about myself is how good of a mom I am,” Logan says. The program made her more confident, she said, so that she has the courage to start her own business and to go back to school. A little-trumpeted part of Obamacare is the $1.5 billion available to states to set up home visiting programs. (What state could turn down free money that will save it hundreds of millions of dollars in social services, prisons and health care?) From a summary of the law to links, including one to a federal list of evidence-based programs called HomVEE (argh, really…it stands for Home Visiting Evidence of Effectiveness), it’s all here. Webinars with interesting and really helpful people. After a summer hiatus, the webinars will return in the Fall. You can view all the past ones, including Fathers and Home Visiting: What Do We Know?, Addressing Challenging Behavior in Children, Engaging Latino Families in Home Visiting Programs, and several presentations about the nuts and bolts of implement a program, including Evaluating for Impact (audio/visual). 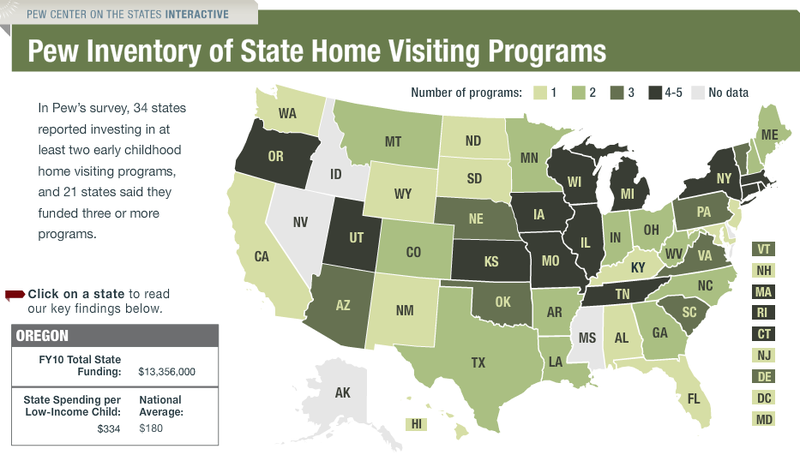 An interactive graphic of the 119 home visiting programs that states funded in 2010. Information for each state includes total state funding, dollars spent per low-income child, and a list of the programs. The last time this map was updated was in March 2011. But Jennifer Stapleton, communications manager for the campaign, says they’re working on a new one that will be posted early next year. As I’ve said before, every family, no matter how rich or poor, can use home visits. This is especially true since the CDC’s ACE Study and the subsequent ACE surveys by 18 states, have shown just how common child trauma is, even in the middle and upper-middle class. If what many people believe is true — that poverty doesn’t cause ACEs…ACEs cause poverty — then that’s a huge argument for replacing our current system — the one that requires children endure months and/or years of emotional and/or physical damage before we intervene — with a system that makes sure all children and families get as much help as possible.